Merchants can accept credit card and ACH payments online by creating secure payment forms, buy now buttons or integrating into major third-party shopping carts. With Simple and Advance Integration Protocols, Charge Anywhere provides e-commerce integrations to suit any merchant. This mode is ideal for merchants and developers who want to integrate payments in the easiest way possible. This type of transaction is referred to as Basic SIP. The merchant does NOT need an SSL certificate for this mode of payment forms. 1. A shopper browses the merchant’s website and selects items. When the shopper wishes to make a payment, they will click the link on the merchant’s website. 2. This will redirect the shopper to CHARGE Anywhere’s secure server where the transaction will be completed. The payment form is securely hosted by CHARGE Anywhere. The payment form can be made to pop up in a new window, or remain in the open window. 3. 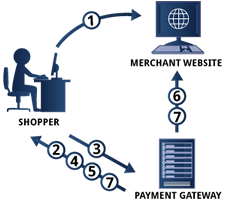 The shopper will fill in all of the information that the merchant requires to complete a transaction and then click submit. Information is sent directly from the shopper’s PC to ComsGate. The payment information is not passed through the merchant’s website. 4. CHARGE Anywhere will process the transaction and provide a response to the shopper. The transaction details and payment information are automatically stored securely in ComsGate for real time viewing. 5. Once the transaction is complete, CHARGE Anywhere will display a generic receipt to the shopper. If the merchant wishes, CHARGE Anywhere will display a merchant formatted receipt to the shopper. 6. If the merchant wishes to receive real time response details via an html post, CHARGE Anywhere can send the response details to the merchant in real time. The merchant can set their web site to act on the information right away. 7. An email with the response details will be sent to both the merchant and the shopper if an email address is provided. This is the next level of implementation for users with an intermediate knowledge. This mode will allow merchants to use their own URL for the payment form. This type of transaction is referred to as Advanced SIP. The merchant does NOT need an SSL certificate for this mode of payment forms. 1. A shopper browses the merchant’s website and selects items. When the shopper wishes to make a payment, they will click the appropriate link on the merchant’s website. 2. This will bring up a payment form on the shopper’s screen. This form will be hosted by the merchant and have the same look and feel as their website. The payment form can be made to pop up in a new window, or remain in the open window. 3. 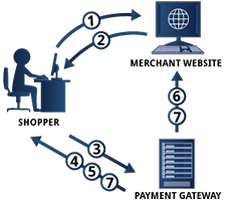 The shopper will fill in all of the information that the merchant requires to complete a transaction and then click submit. Information travels directly from the shopper’s PC to ComsGate. The payment information is not passed through the merchant’s website.